The Federal Reserve is likely the biggest threat to the bull market. As the Fed continues on its current path, every new rate hike is one step closer to a bear market and a U.S. recession. After all, every previous interest-rate hike cycle saw a recession within a year and a half of the final rate hike. The Fed doesn’t want to do that again. It wants to finally get through the current hike cycle without choking the economy to the point of a recession. That’s why the Fed will be watching the monthly influx of data to make sure it doesn’t, but the single most important piece of data is prices. That’s its main mandate — to support stable prices. To the Fed, that’s a 2% inflation target. Inflation is the measure of prices based on the consumer price index — prices for a basket of goods and services tracked monthly. Consumer prices slow and steady climb will force the Fed to keep raising rates. Inflation needs to be subdued for the Fed to put the brakes on interest rates, and we desperately need that to be the case. 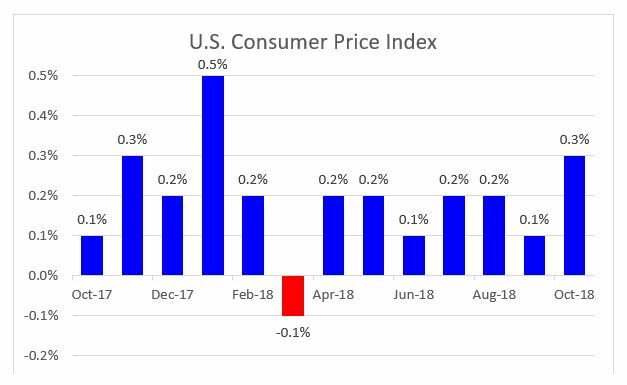 The consumer price index will be something everyone in the stock market watches closely, as the Fed will base its rate-hike cycle on this stat. If the previous rate hikes don’t start to tame prices, the Fed could be on a collision course with our economy and the stock market. Right now, the damage isn’t bad enough to trigger a recession just yet. But, if the Fed hikes two or three more times, it would be at a point that is critical for the economy. That would put them near 3% on the Fed Funds rate. The Fed is highly expected to raise rates in December, and possibly another three times in 2019 if it continues on its current course. No one knows which level will spark the next recession, but everyone agrees, the Fed is walking a thin line if it continues to increase rates. For now, the bull market lives on, and you should invest accordingly.